This ugly plastic car wash trash bag just wasn't cutting it, refused to stay where I put it and was just depressed me to look at. 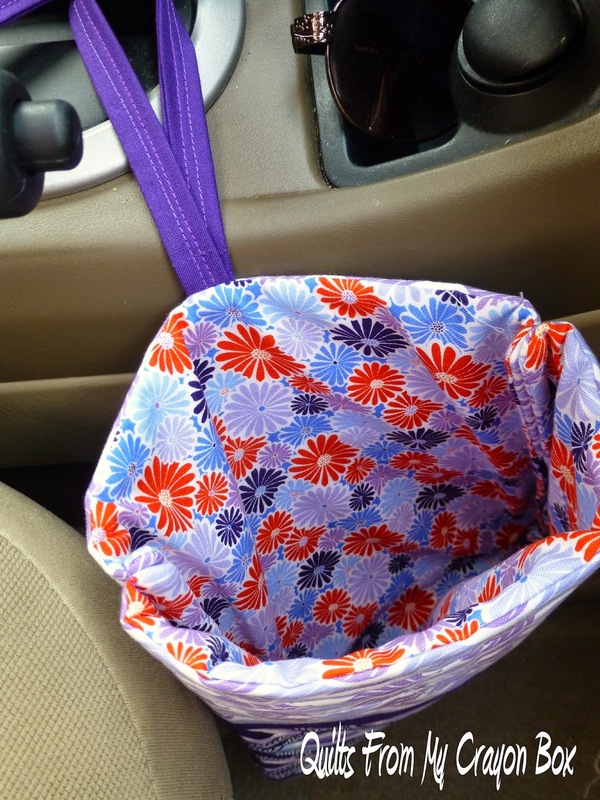 But a gal needs a car trash bag to help keep her vehicle up as best as she can while still toting around two kidlets who can be pretty messy, right? The other day I was flipping through a bunch of books and magazines looking for a specific quilt pattern and one that I looked through was this copy of 101 Patchwork Projects & Quilts, published in 2011 by Quilting Arts Magazine. Inside I saw this picture. 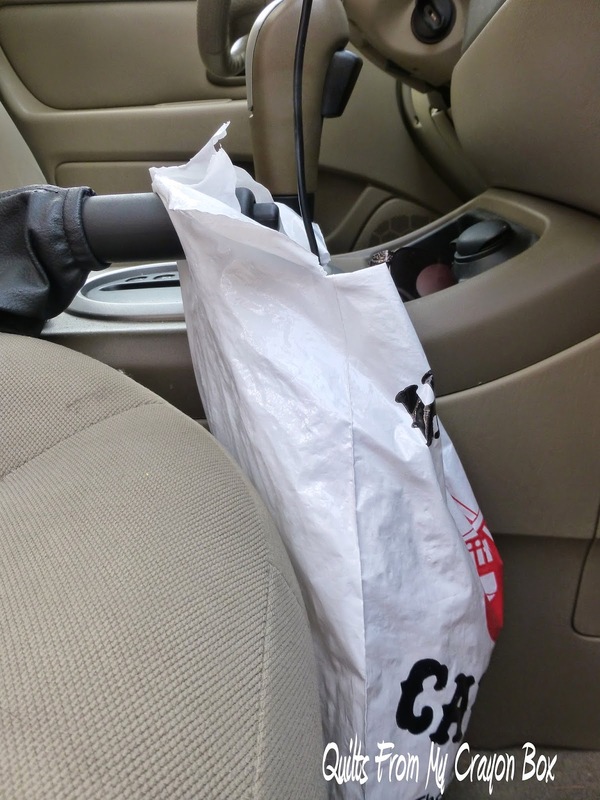 I knew immediately that I needed one of those for myself and it would be the answer to my ugly car trash bag problem. 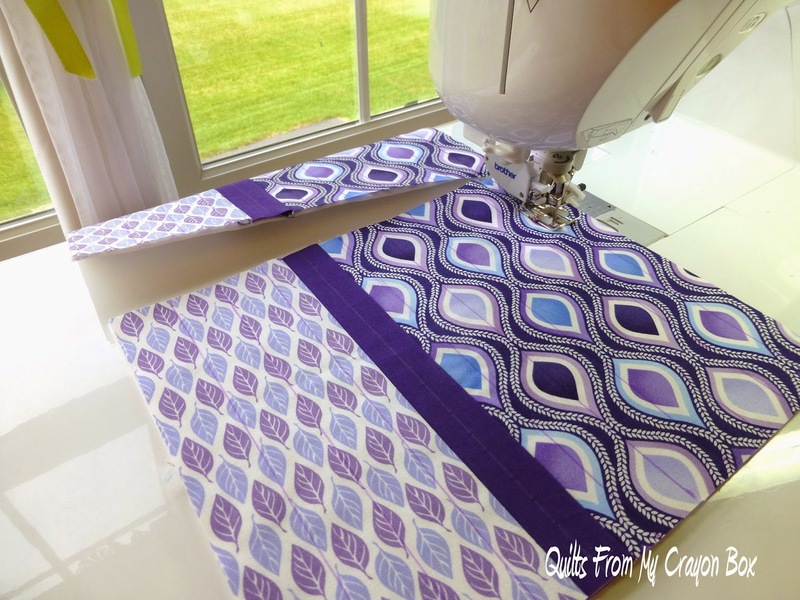 I grabbed a couple of pretty coordinating leftovers from the Kate Spain Charm Swap and within minutes the pieces were sewn and ready to quilt. I didn't have the flannel the pattern called for so I used batting scraps instead. Some straight lines were the order of the day and were done quickly. My plan was to add cross hatch lines in the opposite direction but after I completed the first line I decided that I didn't care for it and chose to leave it with just the the horizontal lines only. 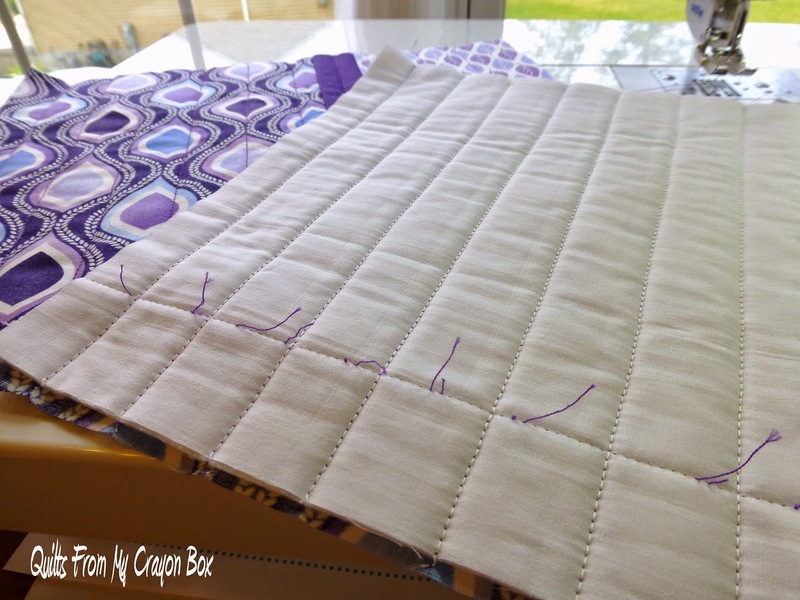 A little unsewing was in order but at least it was only one row. Ta Da! Here is my new and much improved car trash bag. I love the result and it makes me so much happier to look at. Sometimes I'm an easy gal to please. Isn't this so much better than that nasty plastic thing? The prints are oriented sideways because it was all the width that I had of these scraps but I'm ok with that. This little project was super fast to whip up and I know that I'll be making a few more. I'm sure that everyone in my family needs a nicer car trash bag plus hubs wants a bigger version for his truck. It will be made with more man-ish fabrics of course. I lined it with another favorite Kate Spain print. 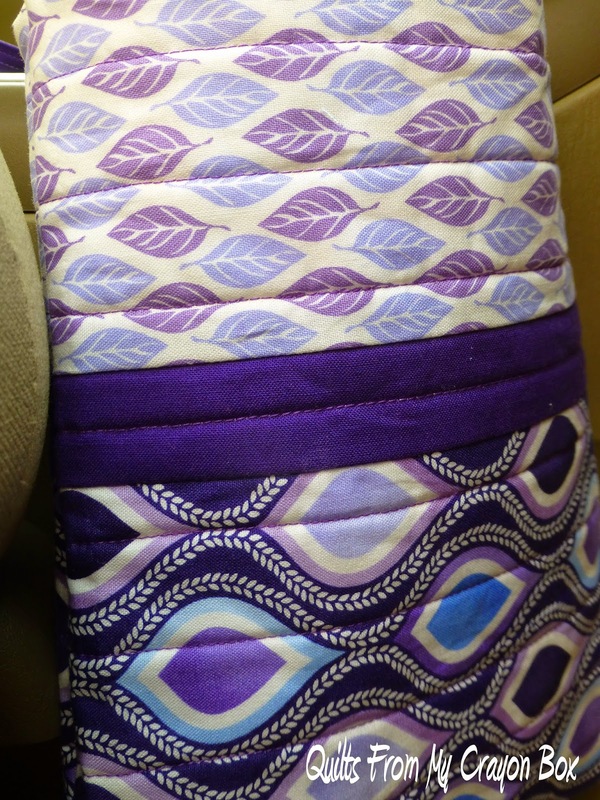 The only other thing that I did different from the pattern was I made a fabric strap instead of using the ribbon called for. I knew that the ribbon wouldn't hold up as well plus it is just pretty. And to be totally honest, I didn't want to wait to finish it til I went to the store to buy the matching ribbon. 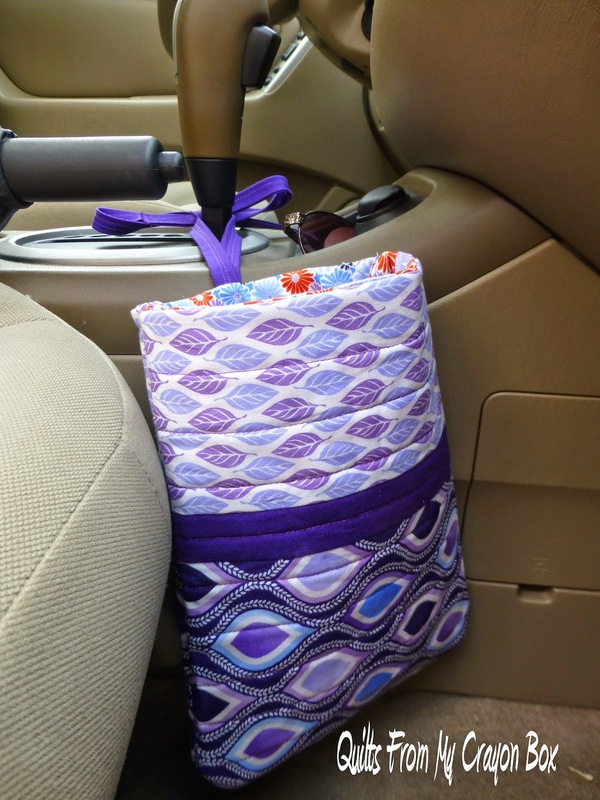 I'm already planning a few other new car trash bags for myself, perhaps one for each season. People change out their home decorations seasonally so why can't I do the same in my car? Very nice! I agree with Diane - too nice for trash! But it will make you happy as you drive around. Enjoy.. Might have to make one myself. Yeah..I like this bag! Makes me think that I'm needing one too. Thanks for sharing. love it, I have that problem too, I have one plastic bag attached to the front arm rest but the opening is in the back.. not that anything gets IN THERE!! OH my, that is a very very pretty "trash" bag! :) You did a lovely job. Such a good idea, and yours is just adorable. I think I'd add a plastic bag liner to it before tossing trash inside, thinking of the empty chocolate bar wrappers and apple cores that could splotch the inside. 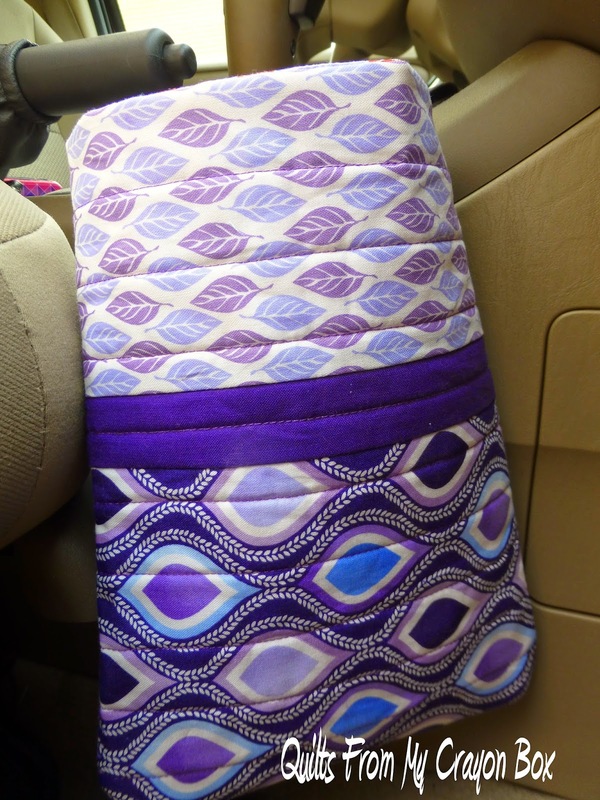 I bet you love having this pretty in your car!